From a distance, the fire that incinerated two Ephraim trailers appears as a towering inferno. Families believe the fire started on the porch of one trailer and crossed to the other, but investigators say it’s too early to say what caused the blaze. EPHRAIM—Two families lost their homes and everything in them on Friday afternoon when a fire started at one trailer and spread to a second trailer, completely destroying both units. The fire happened at approximately 3:30 p.m. at the mobile home park at about 400 N. Main St. The park is not the same facility that has been in the news lately because of city complaints of code violations. Witnesses say the fire started on the porch of one home and spread quickly to the adjacent trailer. 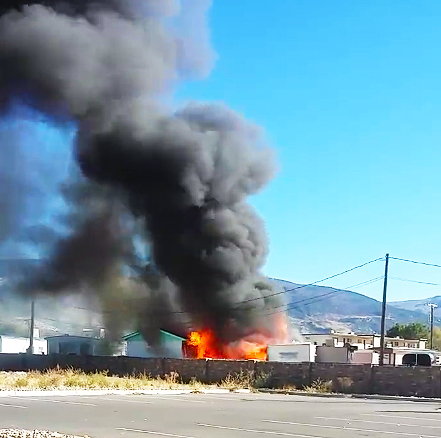 The Ephraim City Fire Department responded within 5 minutes of being called, but the blaze grew too quickly for firefighters to do anything but contain it to the initial two units. 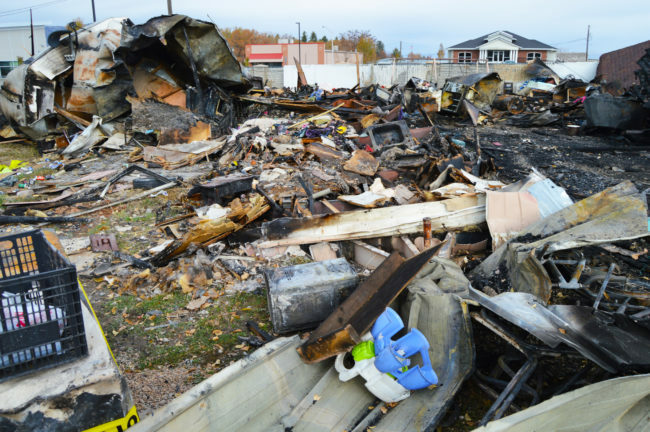 By the time the firefighters extinguished the blaze, nothing was left but charred rubble. No one was killed or injured, though, and Ephraim City Manager Brant Hanson says the fast response prevented the fire from spreading to other nearby trailers. The trailers were owned by the Richard and Azucena Jasmine Tinoco, and the Jose and Maria Guadalupe Juarez families. 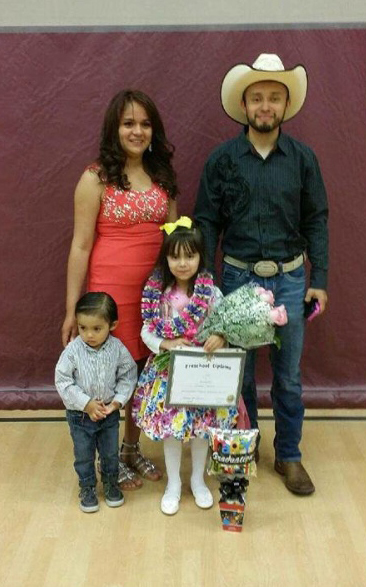 The Juarez family has four young children, while the Tinocos have two. 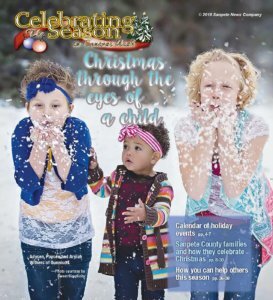 All of the children in both families are age 5 or younger. Richard Tinoco says he was inside his home watching TV when his wife burst through the front door and told him the home was on fire. After Tinoco had made sure all of the Juarez family members were outside, he says he called 911. Tinoco says by the time the fire department arrived, the fire had spread to his family’s home and the flames were blocking the doors of both homes, so neither family had any chance to re-enter to attempt to recover belongings. “The guys attacked the way they were trained to do so. Manti and Sterling also sent us some manpower to help with the blaze,” Ephraim City Fire Chief Kerry Steck says. Steck says it took the firefighters about 20 minutes to contain the flames so they would not spread. From there, they worked on completely extinguishing the fire. The next day, both families sifted through the smoldering ashes to see if any of their possessions were salvageable, but Tinoco says flames and smoke had ruined everything. The fire destroyed one of the Juarez’s cars. Another vehicle is severely charred, but the family says it is still usable. Neither of the families’ homes or possessions was insured. Tinoco says he spoke with several other trailer court residents, but no one was able to say how the flames started. “Everyone pretty much says that kids were playing on a couch [on the porch], and that’s where we know it started. We don’t know exactly how it started, all we know is it started on the front porch,” he says. Juarez is a stay-at-home mother and says all of her four children (the oldest of whom is 4) were in her care when the flames broke out. She says her oldest child was frightened when she saw the fire and became more startled when she heard fire and police sirens. Steck says it’s too early to confirm the cause of the fire. Ephraim Police Officer Darren Pead is heading up the investigation, and the fire department is cooperating with Pead. Both families are staying the family and friends right now. Both say the Catholic Church, the LDS Church and other members of the community gave them food, blankets and money following the fire. A GoFundMe campaign has been launched to gather additional donations. The link is at https://www.gofundme.com/2-families-in-need-because-of-fire-2vgwevc4. This loss happened at a time when the mobile home parks have been a hot topic at Ephraim City Council meetings. The fire is an example of some of the concerns that have come out, City Manager Hanson says. The trailers probably do no comply with current codes, Steck says, but the park had been in place long enough to have grandfather exemptions, Steck says. Recently the city entered into a contract with Sunrise Engineering of Fillmore to get help conducting inspections and enforcing codes. City and Sunrise Engineering employees inspected a different mobile home park at 200 North and 200 West a few weeks ago and found code violations that had been piling up for years. The Ephraim/Sunrise team was scheduled to inspect the Main Street park next. If you don’t address the issues in a mobile home park for 15 years, Hansen adds, it’s going to get systematically worse and amounts to the city condoning that behavior. “That’s not ok,” he says. 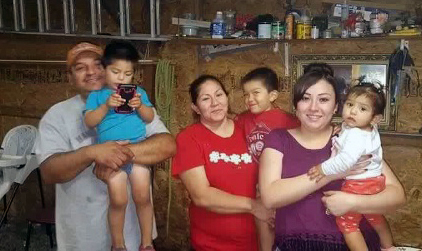 Azucena Jasmine (back left) and her husband Richard Tinoco (Back right) and their two children were one of the families whose home burned down after a fire started on their neighbor’s property. Jose Luis Juarez (left) and his wife Maria Guadalupe’s (center, red shirt) and their four children lost all of their possessions in a house fire at an Ephraim mobile home park last Friday.